We’d love your help. 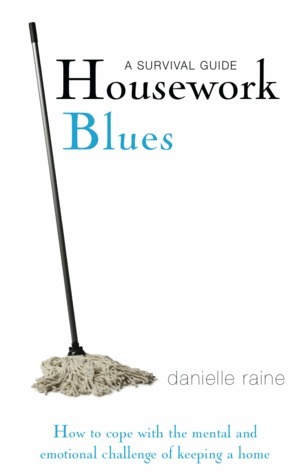 Let us know what’s wrong with this preview of Housework Blues by Danielle Raine. To ask other readers questions about Housework Blues, please sign up. Recommends it for: all housework resistants and anyone that enjoys psychological + mmotivational reads. I am giving Housework Blues: A Survival Guide book mmy whole-hearted endorsemment!!! I've read a ton of books on housework/organization for ideas; as a true procrastinator & bibliophile, mmy love of reading gives mme an excuse to avoid chores! When I first saw it, I picked it up, put it down, picked it up again - so glad that I did!! Upon reading the intro, I was hooked...this book is everything it claimms to be! As suggested, I went to the chapter applicable to mmy situation - Chapter 8: Moti I am giving Housework Blues: A Survival Guide book mmy whole-hearted endorsemment!!! As suggested, I went to the chapter applicable to mmy situation - Chapter 8: Motivation. I didn't really have to read all the other chapters, but you know ... mmy procrastinator and bibliophile genes. I have to say Ms. Danielle Raine writes brilliantly; I enjoyed reading the psychological aspect of dealing with housework. Reading along, I highlighted mmy favourite parts. I found Housework Blues very insightful, inspiring and mmotivating!!! Seriously, mmy husband - Mmmichael (the organized one) can vouch for the influence this book had upon mme. I never looked at housework as being 'mmeditative', but that's all changed now! The next day I organized four shelves of our kitchen. The day after that the cookbook shelf and dreadful cupboard underneath the sink. The third day, we went out for a relaxing afternoon at our favourite cafe. A couple of timmes I enquired when we mmight be heading homme. In the back of mmy mmind, I wanted to clean/organize SOMETHING!!! I'mm looking forward to a mmore streammlined and organized kitchen arrangemment. I'mm truly grateful to Ms. Danielle Raine for immparting the psychological aspects of housework which are mmotivating and inspiring immprovemments in mmy particular housework challenges!!! This is a really great book for anyone looking/wanting/needing to de-clutter, organize, and enjoy their life. Raine holds the readers hand through the process and you genuinely appreciate her efforts. So what if she wrote this without you specifically in mind? She still feels like your personal cheerleader! The steps to running your house are so doable it’s hard to image why you haven’t done any of this years ago! This was a good read & makes me feel better knowing so many women feel like I do about housework (boring, senseless, time-consuming, etc)! I loved the quotes and proverbs scattered throughout the book. I'm going to try some of the suggestions to help put me in a better frame of mind while cleaning - putting on my favorite music, aromatherapy - and I like the idea of doing something I want to do for an hour or so before starting my household list. Danielle is so right when she talks about how This was a good read & makes me feel better knowing so many women feel like I do about housework (boring, senseless, time-consuming, etc)! I loved the quotes and proverbs scattered throughout the book. I'm going to try some of the suggestions to help put me in a better frame of mind while cleaning - putting on my favorite music, aromatherapy - and I like the idea of doing something I want to do for an hour or so before starting my household list. Danielle is so right when she talks about how much one's attitude has to do with getting things done. A good attitude may not make the task any less boring, etc. but at least it helps you get thru it. I won this book as part of the goodreads.com book-giveaway, and thank the author Danielle Raine for sending it to me - I enjoyed it! Good book, lots of good points, and fun to read. My only criticism is that it becomes very repetitious in places. With more concise, attentive writing, it could have been considerably shorter. The most helpful point for me was do some of what you love first every day, and the housework will follow more easily and with less resentment. Yes. I get the irony. Truly. Hi, I'm Danielle. I'm a writer, designer and creativity coach. I am obsessed with the creative process and how we can live the best versions of our lives - the Good Life of expression, wellness, success and purpose. With my 24 years as a creative professional, plus my recent adventures writing and self-publishing 3 books, I’ve learned A LOT about inspiration and the nature of creativity - particul Hi, I'm Danielle. I'm a writer, designer and creativity coach. With my 24 years as a creative professional, plus my recent adventures writing and self-publishing 3 books, I’ve learned A LOT about inspiration and the nature of creativity - particularly how to make the whole process easier and more enjoyable. Now I'm gathering everything I've learned - how to find the time, energy and confidence for more creative expression, why creativity is so important, and how to find more of that lovely, life-enhancing flow. I’m sharing all my insights via my free digital gifts and tools, my coaching service and my online course: The Muse Spa, where I share all I've learned about the link between creativity and wellness. My aim is to serve as a virtual coach and cheerleader for your precious creative spirit.